G F Watts's sculpture of Clytie, a wood nymph. This is the bronze bust of a girl that tells a story. Watts's sculpture is a passionate expression of a young woman metamorphosing into a plant. The myth, according to Ovid, was that the wood nymph, Clytie, fell in love with Helios, the sun god. She loved him so much that she followed his course across the sky each day, turning her neck as far as she could so as to see him better. The god became tired of being under such scrutiny, so the story goes, and turned poor Clytie into a flower, (some say a sunflower, others a heliotrope). The irony is that both of these flowers turn their heads towards the sun, and so the god was still under Clytie's gaze. She is turning her lovely neck as far as she can to get her last sight of her love, while the leaves are growing round her shoulders, and soon she will cease to be human. The bronze stands in the historic main gallery at Watts Gallery - Artists' Village. In 1867 Watts hired a studio from a friend in order to have peace in which to make the bust he was imagining, away from the distractions of his usual busy life. 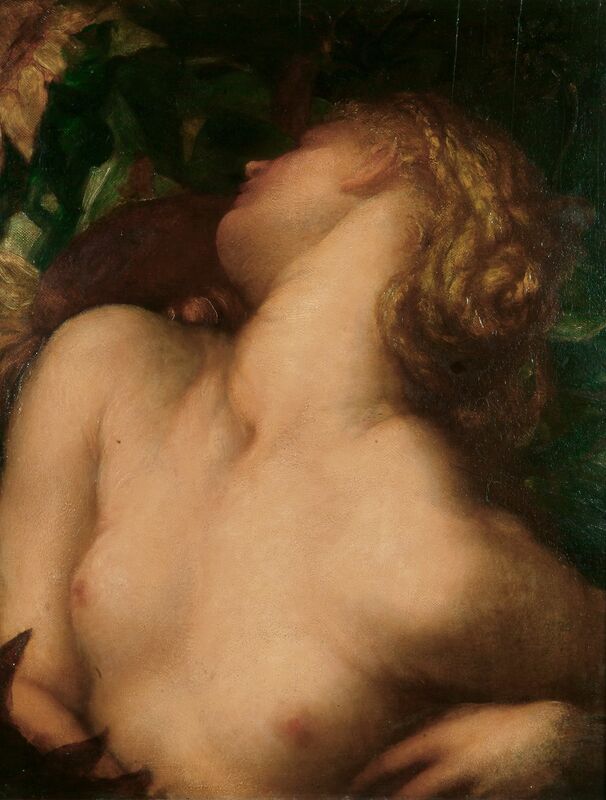 The extreme craning of Clytie's neck was to illustrate the story of the myth; but also because, as can be seen in other works of his, Watts enjoyed modelling, carving, and painting the human neck in all its possible circumstances. Watts made several versions of this sculpture - see if you can spot them in and around the Artists' Village!